This information outlines correct use of the IADC logo for members, chapters and partners. 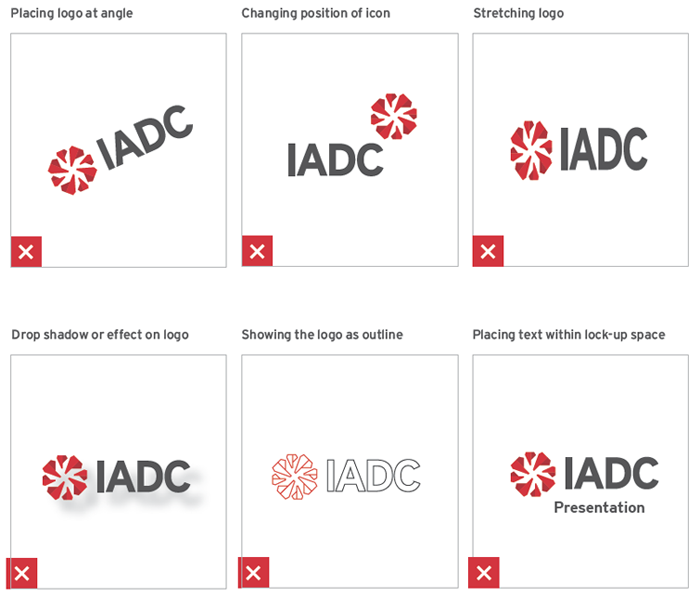 For a set of full brand guidelines, or for information on the use of the IADC brand please contact marketing@iadc.org. 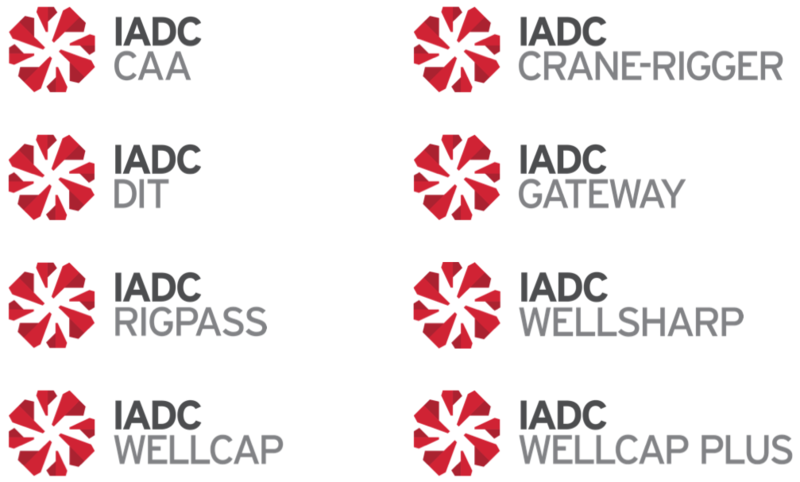 The official IADC logo is a trademark of the International Association of Drilling Contractors and is protected by international copyright laws. This logo is reserved for official IADC use. Downloading or copying the IADC logo for corporate or personal use without the permission of IADC is a violation of these laws. The formal name of the organization is the International Association of Drilling Contractors. IADC is an acceptable abbreviation, but printed materials such as letterhead and business cards should include one occurrence of the formal name in its complete form. IADC members are entitled to use the IADC Member Logo for promotional purposes. Use of the ‘Member’ logo is not permitted on training certificates or in any fashion that may signify IADC accreditation or endorsement of any program, contract or service. Member logo files are available for download at www.iadc.org. If log-in is unsuccessful, please contact membership@iadc.org. IADC authorizes each accredited training provider to use only the specific accreditation logo for which the company is accredited. Use of program logos must be in accordance with the program’s accreditation procedures and the guidelines established for program logo usage (found in each program’s handbook) and also in accordance with IADC’s Logo Usage Guidelines. To request ACD Program logo files, please contact accreditation@iadc.org. IADC provides each chapter with a unique logo that contains the name of the chapter. The chapter may use these logos across a variety of applications such as signage, social media, chapter-specific documents, and branded merchandise. 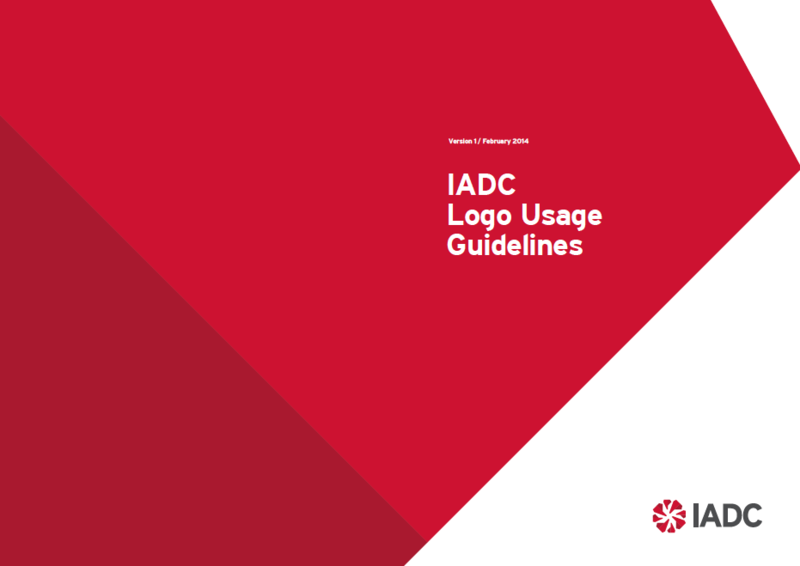 Use of the Chapter logos must be in accordance with IADC’s Logo Usage Guidelines. To request Chapter logo files, please contact marketing@iadc.org. The logo is one of IADC’s most important assets. It allows audiences to identify our programs, services and communications at a glance. As such, it is important to ensure it is presented in its optimal form. The primary format is full color. This should be used wherever possible. The symbol color is PMS 186 C and PMS 187 C (or equivalent). The wordmark is 85% black. For use on darker backgrounds the logo can be produced in solid white with PMS Cool Grey 3 C to add depth to the symbol. Care should be taken to ensure the logo is not cluttered by other visual elements such as typography, graphics or busy areas of photography. An exclusion zone of 50% the width of the symbol should be clear of visual distraction around all sides. To protect the legibility of our logo, a minimum size has been established. 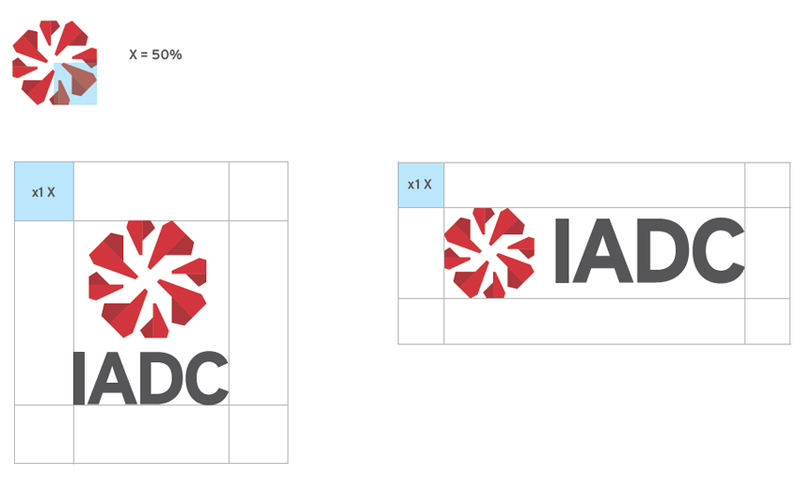 The IADC logo should always be presented using the version that gives the greatest stand-out against background image/color. To protect the integrity of the logo it should be used as shown in the examples in this guide, avoiding any application shown below. To request logo files, please contact marketing@iadc.org. Additionally, you may use the contact information listed below. Logo files are provided in two types: EPS and PNG. EPS – high-resolution, vector graphic to be used for printing brochures, posters, signage, and promotional items (will be required by printing and promotional products vendors). This file type can be opened in Adobe Illustrator, Adobe Photoshop and Microsoft Word. PNG – low-resolution graphic designed for digital/screen applications, such as web, email and PowerPoint presentations. While the PNG file can be used for basic print applications with caution, we recommend an EPS file to ensure the highest quality. Enlarging a PNG file can cause pixilation; we have provided a large enough file that enlargement should not be necessary. The benefit of this file type over JPEG is that it has a transparent background, and will not create a white box surrounding the logo (which goes against IADC’s logo usage guidelines). It is important that the logo is properly applied in order to ensure that IADC is presented in a professional manner. If you have any questions about the tips below or to request a different file type, please contact marketing@iadc.org. Email: The PNG file is most appropriate. It is best to insert the file directly from your computer into the message rather than copying and pasting. PNG files can be reduced in size, but will become pixilated if enlarged. Name Badges: The EPS file is most appropriate. It can be opened from within Word. It is best to insert the file directly into the document rather than copying and pasting. It can be resized as needed without pixilation. Presentations: The PNG file is most appropriate. It is best to insert the file directly into the message rather than copying and pasting. PNG files can be reduced in size, but will become pixilated if enlarged.